Brighten someone's day with a Beaducation Gift Certificate! 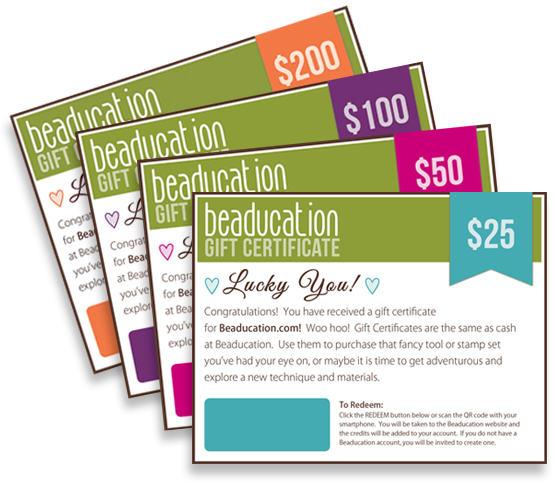 Beaducation Gift Certificates must be purchased separately from other items in our online shop. You will be asked to create a Beaducation account to complete this purchase. The reason we ask you to create an account is because you will be given the option to send the gift certificate via email directly to the recipient from your account. You may also email the certificate to yourself, where you can forward it or print it to deliver in-person. Simply select the amount you wish to purchase and enter payment information all on one page. Once your purchase is complete, you will receive a confirmation email. To send the gift certificate via email, visit the My Account page and select Gift Certificates from the menu.